1.1. Three-dimensional chess is played between two opponents who move pieces or attack boards alternately on a game set called a '3D-Chessboard'. The player with the white pieces commences the game. A player is said to 'have the move', when his opponent's move has been completed. 1.2. The objective of each player is to place the opponent's king 'under attack' in such a way that the opponent has no legal move which would avoid the 'capture' of the king on the following move. The player who achieves this is said to have 'checkmated' the opponent and to have won the game. The opponent who has been checkmated has lost the game. 2.1. The 3D-Chessboard is composed of 3 main boards and 4 moveable attack boards. 2.2. A main board is composed of an 4x4 grid of 16 equal squares alternately clear (the 'white' squares) and coloured (the 'black' squares). 2.3. An attack board is composed of an 2x2 grid of 4 squares. 2.4. By looking at the 3D-Chessboard from the top, the 3 main boards form one board, 8 squares long and 4 squares wide. The lower-most board is termed "White's Board (W)", the middle board is the "Neutral Board (N)" and the top board is "Black's Board (B)". 2.5. 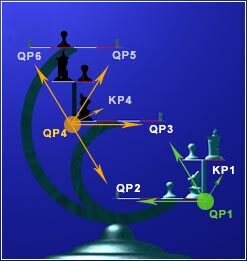 The attack boards start the game on the rear pins of the White and Black Boards, and are referred to as "Queens's Level (QL)" and "King's Level (KL)" depending on which side of the board they are located. 2.6. At the beginning of the game one player has 16 light-coloured pieces (the 'white' pieces) and 2 'white' attack boards; the other has 16 dark-coloured pieces (the 'black' pieces) and 2 marked ('black') attack boards. The pieces are as follows: a white king, a white queen, two white rooks, two white bishops, two white knights, eight white pawns, a black king, a black queen, two black rooks, two black bishops, two black knights, eight black pawns. 2.7. The initial position of the pieces on the chessboard is as seen left. 3.1. (a) Any move which can be made in a standard chess game (flat board), can be made in three-dimensional chess. Since every overlapping square is the same color, you have the option of deciding which level you wish it to land on. For this reason two pieces of the same (or different) colours can occupy the same square (on different levels). (b) No piece can be moved to a square (on the same level) occupied by a piece of the same colour. If a piece moves to a square occupied by an opponent's piece the latter is captured and removed from the chessboard as part of the same move. A piece is said to attack a square if the piece could make a capture on that square according to Articles 3.2 to 3.5. (c) A piece is blocking the abiltiy of other pieces to move at all levels (according to Article 3.1. (a) and 3.2 to 3.5). But the moving piece may land above or below the occupied square and continue its move on the next turn. (d) Vertical moves without horizontal movements of a piece are forbidden. This means that a piece can not move to same square on another level. (e) A move which ends on a non-existent square is forbidden (See Article 2.8). 3.2. (a) The queen moves to any square along the file, the rank or diagonal on which it stands. (b) the rook moves to any square along the file or the rank on which it stands. (c) The bishop moves to any square along a diagonal on which it stands. When making these moves the queen, rook or bishop cannot move over any intervening pieces. 3.3. The knight moves to one of the squares nearest to that on which it stands but not on the same rank, file or diagonal. It does not pass directly over any intervening square. (c) the pawn moves to a square occupied by an opponent's piece which is diagonally in front of it on an adjacent file, capturing that piece. (d) A pawn attacking a square crossed by an opponent's pawn which has advanced two squares in one move from its original square may capture this opponent's pawn as though the latter had been moved only one square. This capture can be made only on the move following this advance and is called an 'en passant' capture. According to Article 3.1. (a) you have the option of deciding which level you wish it to land on. A pawn which has been moved by the move of an attack board (See Article 3.6.) can not be captured 'en passant'. (e) When a pawn reaches the rank furthest from its starting position it must be exchanged as part of the same move for a queen, rook, bishop or knight of the same colour. The player's choice is not restricted to pieces that have been captured previously. This exchange of a pawn for another piece is called 'promotion' and the effect of the new piece is immediate. Which rank is called the furthest is depending on the specific situation during the game. On file b and c is allways rank 1 or 8 the furthest, on file z and e this is allways rank 0 or 9. On file a and d the furthest rank vary (0 / 1 and 9 / 8), depending on if an attackboard is overhanging the corner or not. (ii) 'castling'. This is a move of the king and either rook of the same colour on the same rank, counting as a single move of the king and executed as follows: To castle on the King's side: The king exchances it's place with the rook. To castle on the Queens's side: The king is transferred from its original square to square beside of the rook, then that rook is transferred to the square the king has left. [a] if the square on which the king stands, or the square which it is to occupy, is attacked by one or more of the opponent's pieces. [b] if there is any piece between the king and the rook with which castling is to be effected. 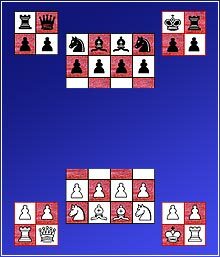 (b) The king is said to be 'in check', if it is under attack by one or more of the opponent's pieces, even if such pieces cannot themselves move. Declaring a check is not obligatory. A player must not make a move which places or leaves his own king in check. 3.6. An attack board can only be moved, if it holds not more than one piece (equal which piece that is). Attack boards are in control of that player, who's piece is located on it. Empty attack boards are the property of the original owner (marking). 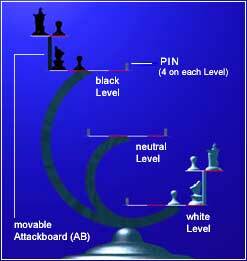 The movement of an attack board is similar to the move of a rook. The distance is any adjacent pin. "Adjacent" means the next pins of the same or the next main board. (Level 1 & 6 have three, level 2 & 5 have four, and level 3 & 4 have five adjacent pins.) Also only empty attack boards can be moved to an backward pin position. Occupied attack board can only move forward or to the side. This diagram should help to understand better the meaning of "adjacent pin". 4.1. Because of troubles with the attack boards the players are allowed to use more one hand to move. 4.2. Provided that he first expresses his intention (e.g. by saying "j'adoube"), the player having the move may adjust one or more pieces on their squares. (b) one piece of each colour, he must capture the opponent's piece with his piece or, if this is illegal, move or capture the first piece touched which can be moved or captured. If it is unclear the player's own piece shall be considered to have been touched before his opponent's. 4.4. (a) If a player deliberately touches his king and a rook he must castle on that side if it is legal. (b) If a player deliberately touches a rook and then his king he is not allowed to castle on that side on that move and the situation shall be governed by Article 4.3. (c) If a player, intending to castle touches the king or king and a rook at the same time, but castling on that side is illegal, the player must choose either to castle on the other side, provided that castling on that side is legal, or to move his king. If the king has no legal move, the player is free to make any legal move. 4.5. If none of the pieces touched can be moved or captured, the player may make any legal move. 4.6. If the opponent violates Article 4.3 or 4.4 the player cannot claim this after he himself deliberately touches a piece. 4.7. When, as a legal move or part of a legal move, a piece has been released on a square, it cannot then be moved to another square. The move is considered to be made when all the relevant requirements of Article 3 have been fulfilled. (a) The game is won by the player who has checkmated his opponent's king with a legal move. This immediately ends the game. (b) The game is won by the player whose opponent declares he resigns. This immediately ends the game. 5.2. The game is drawn when the player to move has no legal move and his king is not in check. The game is said to end in 'stalemate'. This immediately ends the game. In spite of formulating the rules so that every possible situation is covered, there are still questions about positioning and allowed moves. trying to answer those question in the begining some "old ones" here. the board is understood the best by looking from its top. so its always a rectangle is the size of 4x8 squares plus the added single squares of the attackboards. its easier during moving to imagine the board as even. There are no levelboarders during moving a figur! so every move is possible (as mentioned in the rules) which is also allowed on an normal board. e.g. : a rook from a1w can be moved along the complete a-file up to a8b as long there is no other figure in between. the same for the moves from or to an attack board and capturing. something special are the overlaping squares of the attack board. There are "materialized" and "non-materialized" squares. materialized squares are all those where an attack board is positioned (like at start: z0,z1,a0 ect.). are all the others, in the moment not existing but theoretic possible squares on the files z&e and the ranks 0&9, inclusive the never materialized squares b0,c0,b9&c9, are the non-materialized ones. therefore the "true" size of the board is 6x10. e.g. : non-materialized squares can be crossed, if the figure is allowed to, as like during the castling. same with the rook which can be moved from z0/QP1 to z9/QP6 if there are no figures in between on the squares from the possible overlapping attack boards squares z1, z9 or z2-8. M.Klein & J.Meder, Germany, including passages from the rules of the World Chess Federation FIDE. The privat use is explicitly welcomed. A commercial or journalistic use is possible, but only with the allowance from the authors. Thanks again to all who helped to complete these rules. TM , © & ® 1994 Paramount Pictures. All rights reserved. Boelter Design authorized user.